With the baseball season concluded, the leaves falling and November dawning, the NFL has arrived at midseason — when the intensity ratchets up and the playoff races start to take shape. Nine weeks remain in the regular season and there are still 135 of the schedule’s 256 games to be played (52.7 percent). Too early for a must-win situation? Not in Baltimore, where the Ravens (4-4) have dropped three out of four and squandered their strong 3-1 start, falling back to .500 in this win-or-else season. 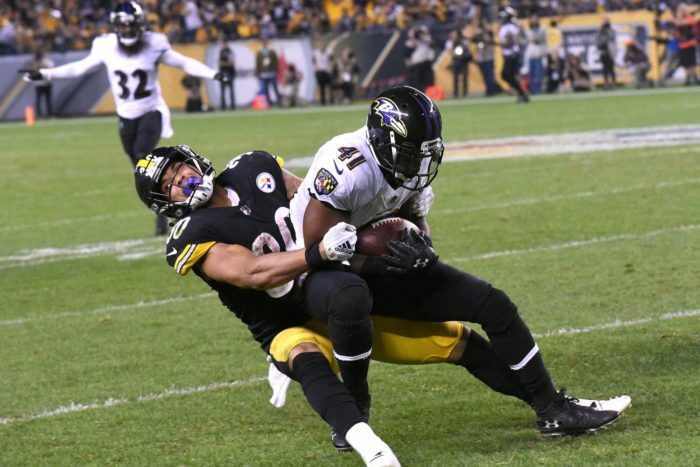 But at least this visit from the surging Steelers (4-2-1) is well timed on one front: Win it and the Ravens are right back in the AFC North race, having swept Pittsburgh this year and laid claim to the head-to-head tiebreaker. Lose it and Baltimore is in trouble, with the Steelers starting to pull away. And we all know that a fourth consecutive non-playoff season likely spells big changes for the Ravens, particularly at head coach and quarterback. The math is straightforward. The high-powered 8-0 Rams appear headed for the top seed in the NFC, and there aren’t many potential losses on their remaining schedule. But this is one of their toughest tests, and the 6-1 Saints could win their seventh straight and pick up the pivotal head-to-head tiebreaker over Los Angeles. That could come in very handy in January should these former NFC West rivals be headed for a rendezvous in the NFC title game. Besides almost always playing entertaining and eventful games, these two perennial NFC playoff contenders figure to be vying the rest of the season for positioning in a conference crowded with postseason hopefuls. There are only so many berths to be won and it wouldn’t surprise anyone if the winner of this Thursday night game earns the key upper hand in the wild-card chase to come. If the Panthers can’t run down the first-place Saints in the NFC South, and the Seahawks are forced to keep looking up at the pace-setting Rams in the NFC West, this matchup of teams that have met twice in recent playoff games (after the 2014 and 2015 seasons) could be critical in the NFC wild-card picture. The NFC North standings are a jumble, with the top and bottom teams separated by a mere game at the moment. But if you expect the cream to rise at some point and the Vikings and Packers to ultimately settle the issue of who finishes in first place, this showdown should prove pivotal. Minnesota and Green Bay tied in Week 2 at Lambeau Field, so 10 weeks later the stakes will be even higher in Minneapolis on the Sunday night of Thanksgiving weekend. The Texans (5-3) and Titans (3-4) are currently the top two teams in the underachieving AFC South, and perhaps the gap will continue to grow and render this matchup less than top-shelf billing. Tennessee won at home against Houston in Week 2, so a series sweep could give Mike Vrabel’s inconsistent club a huge boost toward making it two playoff trips in a row in Nashville. With both clubs trending upwards through Week 8 and currently in possession of a playoff slot, this could be the most important Chargers-Steelers game since the Bolts went into Pittsburgh and upset Bill Cowher’s top-seeded team in the 1994 AFC Championship Game. Dennis Gibson, Neil O’Donnell and I remember that one well, since we were all there that day. Unless you take the Cowboys seriously, the NFC East appears destined to come down to Washington or defending Super Bowl champion Philadelphia. These two play twice in the final five weeks, with the rematch in Washington slated for Week 17. We’re highlighting the first of these head-to-head showdowns, on Monday night in Lincoln Financial Field, because you never really know if the matter of the division title might already be settled by the final week of the regular season. Another Monday night affair that could carry great import in the battle for positioning in the NFC. The Seahawks and Vikings are currently the sixth and seventh seeds, and that gives this one a potential loser-is-done scenario for a backdrop. Both would be in the playoffs if the postseason opened today, but with the Chiefs having already won in Carson in Week 1, this Thursday night showdown figures to be the Chargers’ last best shot at overtaking Kansas City in the AFC West. And did we mention the Chiefs have beaten the Chargers nine consecutive times, dating to the start of the 2014 season? The NFC North race again takes center stage, as does the NFL’s oldest and most historic rivalry. Could we possibly be in for the sequel of their Week 1 meeting in Lambeau Field, when Aaron Rodgers on one healthy leg led the Packers to an astounding second-half comeback and somewhat marginalized the monster first half turned in that Sunday night by new Bears linebacker Khalil Mack? Alas, we can dream. The No. 1 in the AFC was on the line when these two heavyweights met at Heinz Field in Week 15 of last season — you remember, Jesse James, don’t you? — and it’s not inconceivable history could repeat itself. The Patriots won that one and went on to yet another Super Bowl. This year, New England and Pittsburgh are currently the No. 2 and No. 3 seeds, respectively, trailing top-seeded Kansas City. But let’s check back in mid-December and see what’s on the line. Do the Eagles dare start Carson Wentz in this game, risking the bad mojo of having their franchise quarterback play on the same field in which he suffered his season-ending knee injury in Week 14 of last season? Of course they do. This Sunday Night Football glamour game might reek of importance in terms of NFC playoff positioning by the time Week 15 rolls around. Both the Saints and Panthers are in solid playoff position so far, but they meet twice in the season’s last three weeks to in all likelihood settle the NFC South race. The rematch is in New Orleans in Week 17, but again we’ll go with the first meeting, which will play out before the Monday Night Football cameras in Charlotte. What a Week 15 it should be in the NFL. Projecting what will still be on the line in Week 17 is a bit of a fool’s game, but Bears at Vikings holds promise of significance in the NFC North race. Their first meeting of the season won’t be until Week 11 in Chicago, and here’s hoping the rematch has meaning by the time Dec. 30 rolls around. Cincinnati at Pittsburgh, and the aforementioned Philadelphia at Washington and Carolina at New Orleans games all potentially could be must-see affairs.